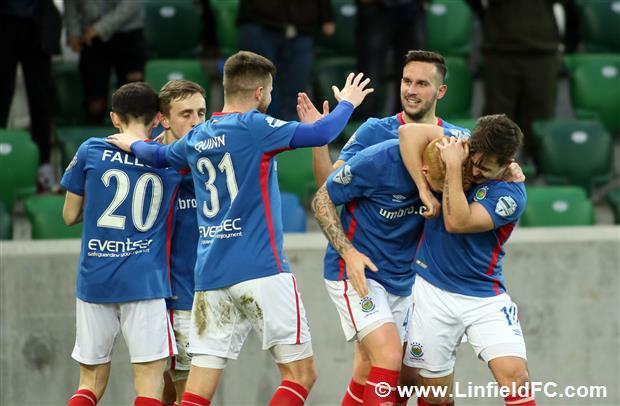 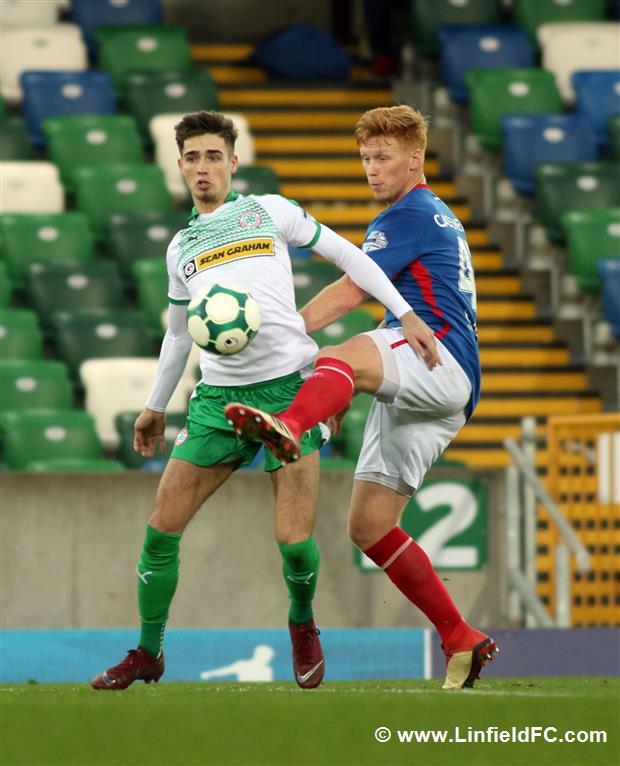 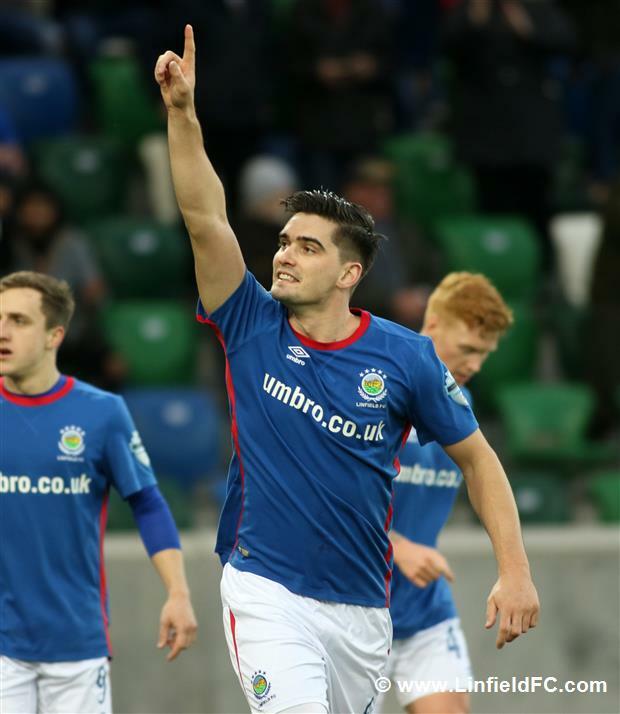 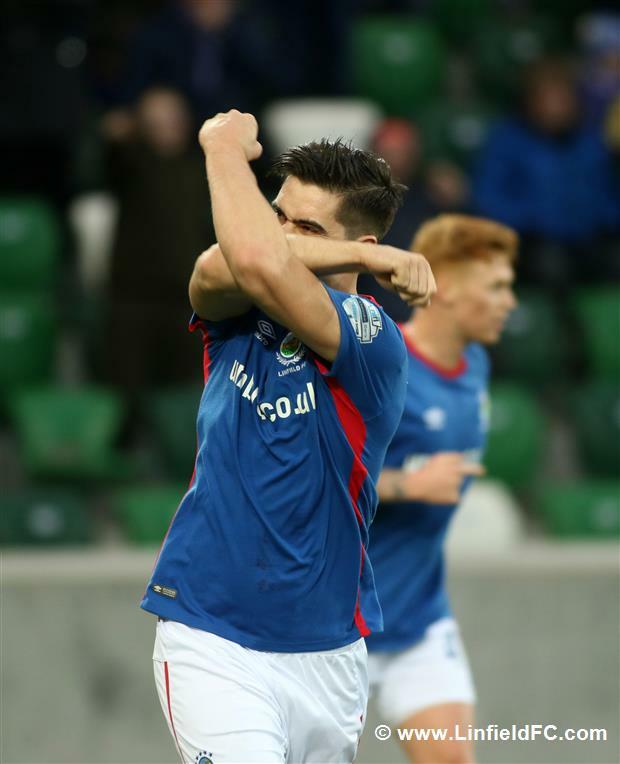 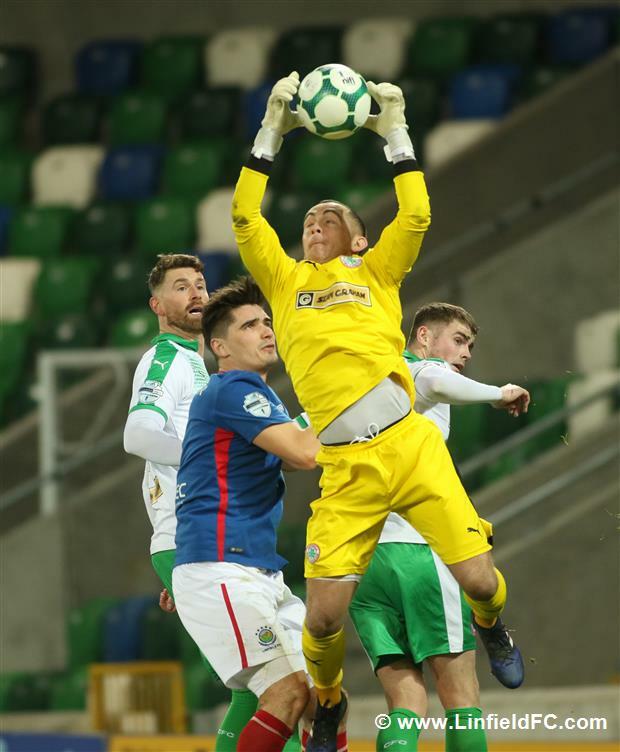 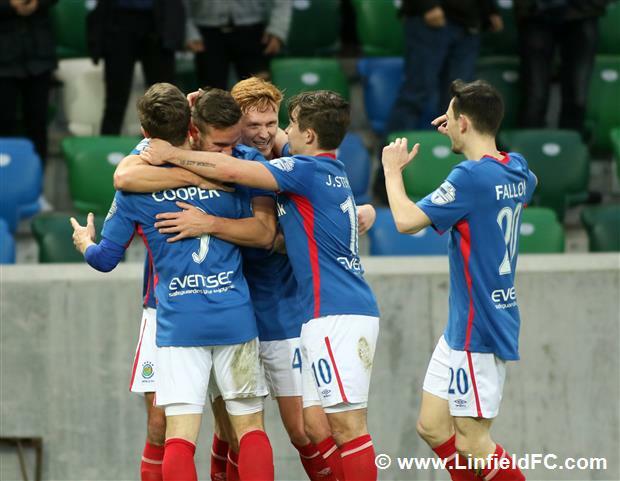 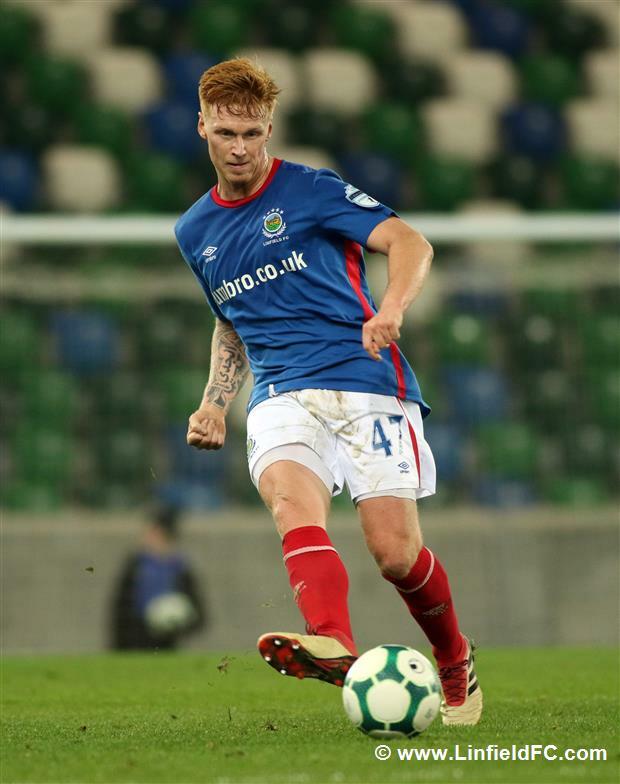 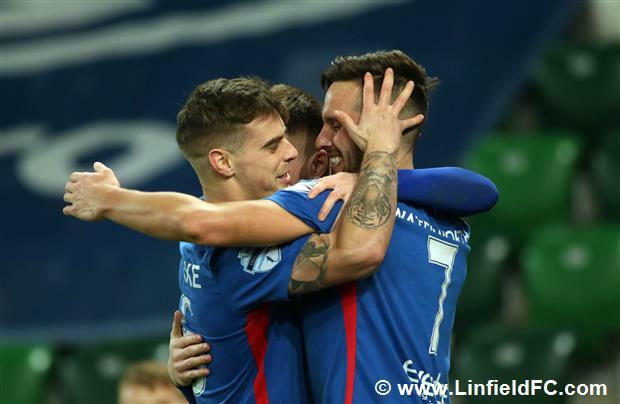 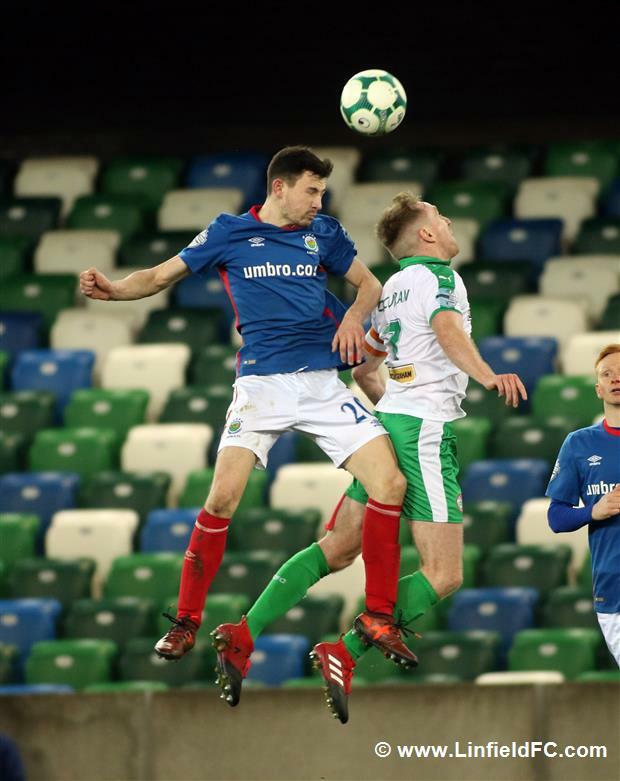 Linfield deservedly defeated Cliftonville in a pulsating six-goal thriller at Windsor Park this afternoon to ensure their return to the top of the Danske Bank Premiership. 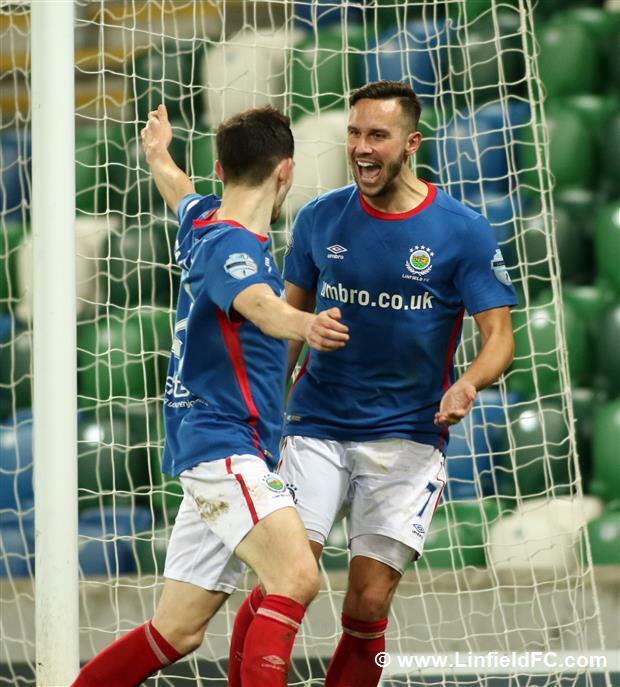 The Blues started like a house on fire and Stephen Fallon was first to go close when he latched onto the ball on the edge of the box before drilling a strike just wide of the far post. 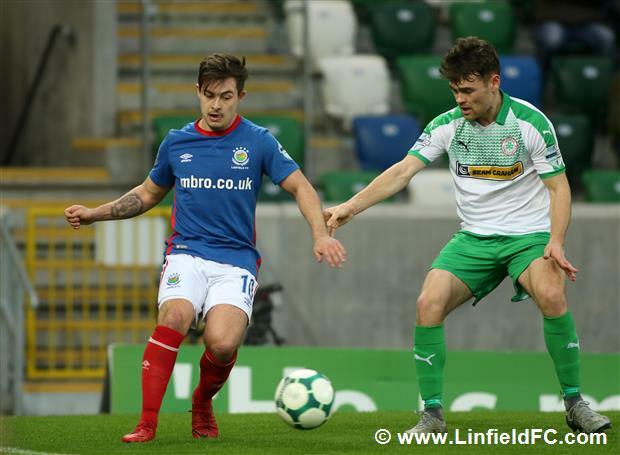 Millar also went close when he connected with Niall Quinn’s driven cross after a neat move down the left, but the winger couldn’t quite turn it on target and the ball was just beyond the reach of the lurking Waterworth. 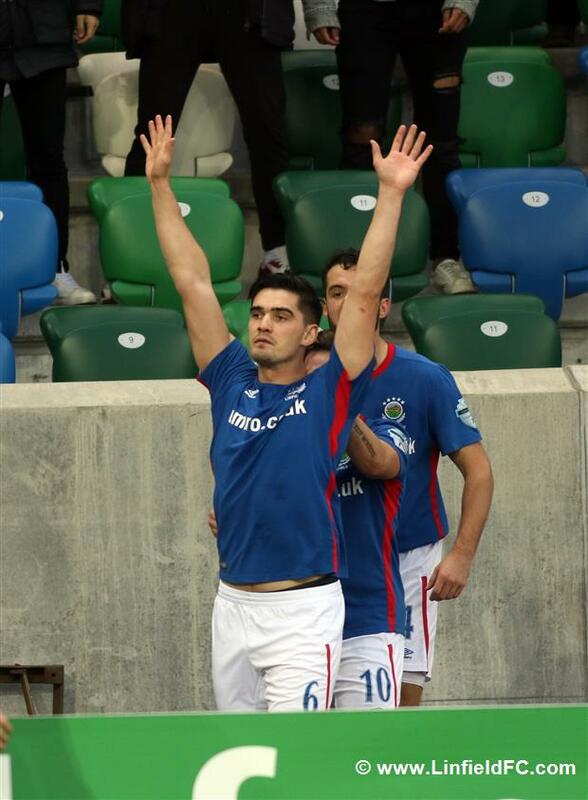 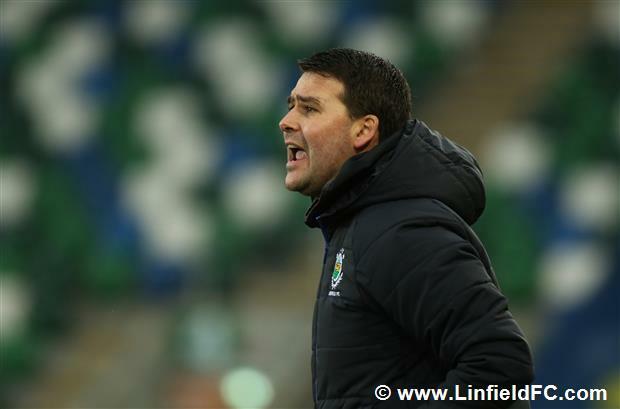 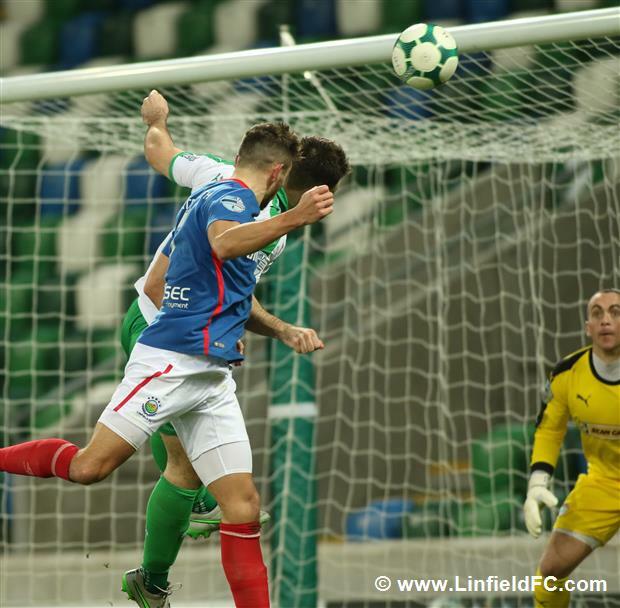 A deserved opener came Linfield’s way on 17 minutes after persistence and pressure. 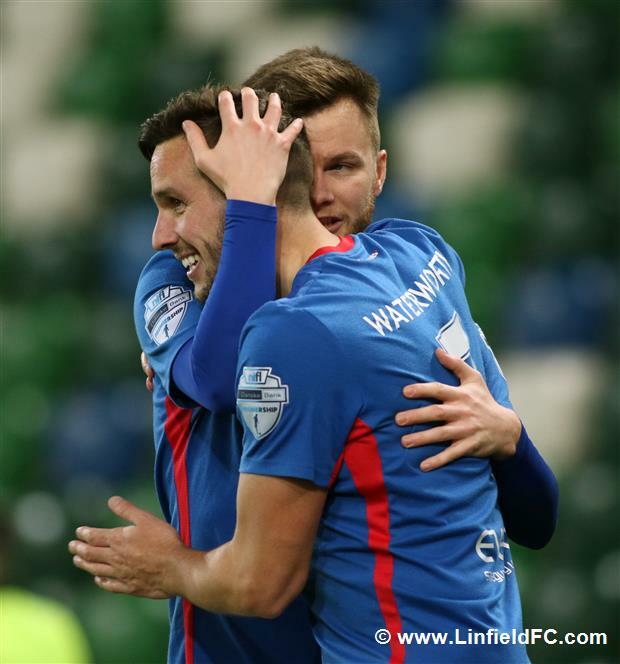 Kirk Millar fired in a dangerous corner and Jimmy Callacher got across his man to power home the opening goal, the defender’s fifth goal of the season. 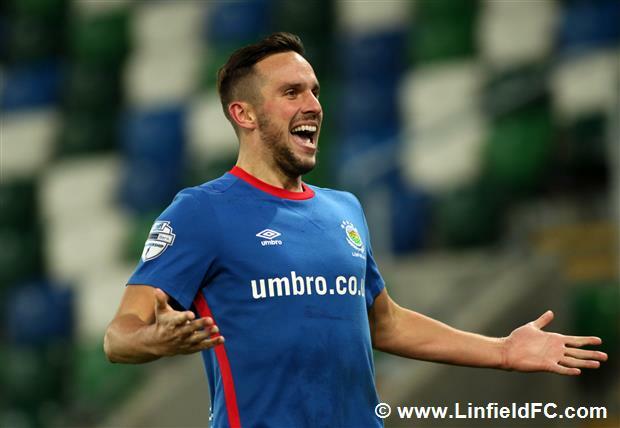 Andy Waterworth should have made it two just before the half-hour mark but he headed a free header just wide from close range after Kirk Millar’s pinpoint delivery. 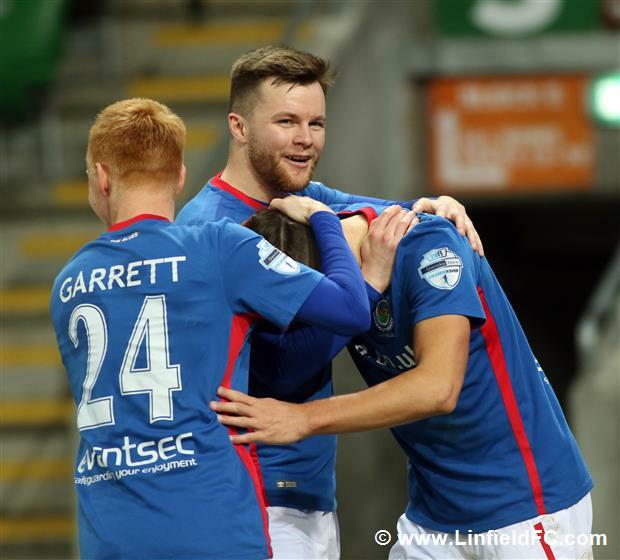 Chris Curran temporarily halted the onslaught when he dragged a shot wide from a good position but The Blues then added a second goal on 36 minutes when Joel Cooper broke down the left before sliding the ball across for Waterworth to fire beyond the helpless Brian Neeson. 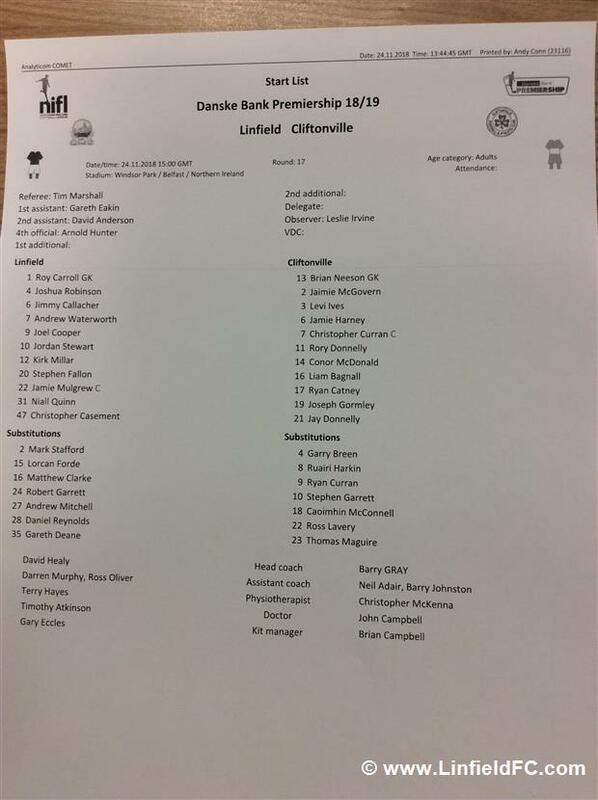 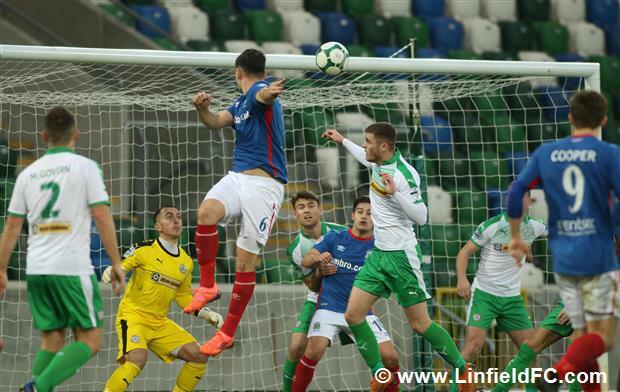 For all Linfield’s dominance, they only went into the break with a one-goal lead after Cliftonville grabbed a lifeline three minutes before the break. 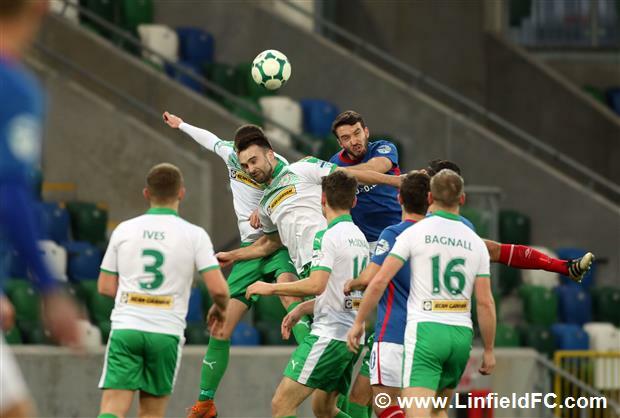 It was well-worked as Conor McDonald skipped past Josh Robinson before passing to Donnelly, who ultimately teed up Joe Gormley to fire into the bottom corner. 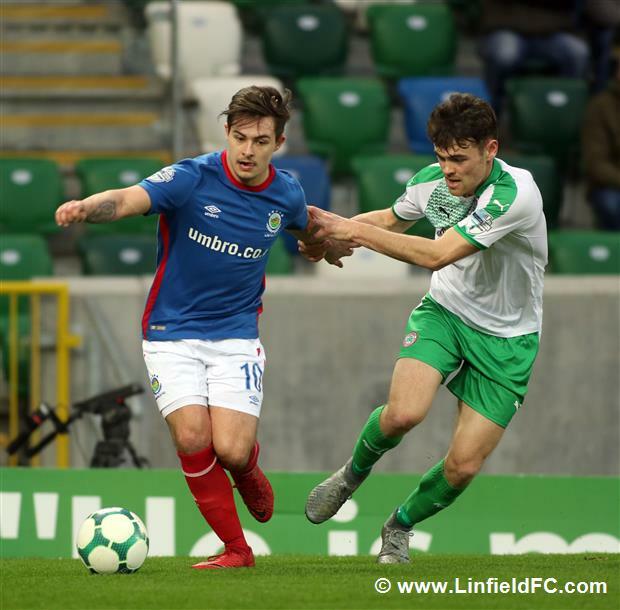 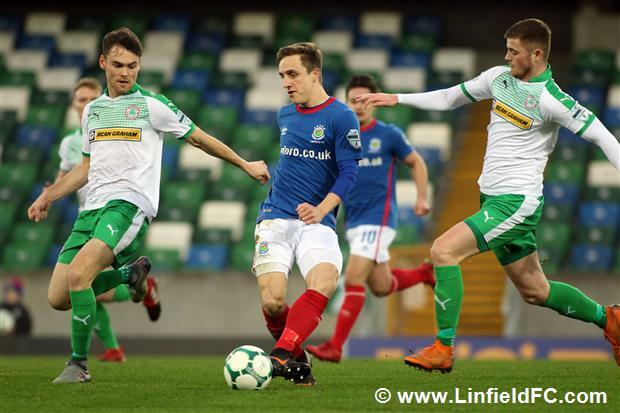 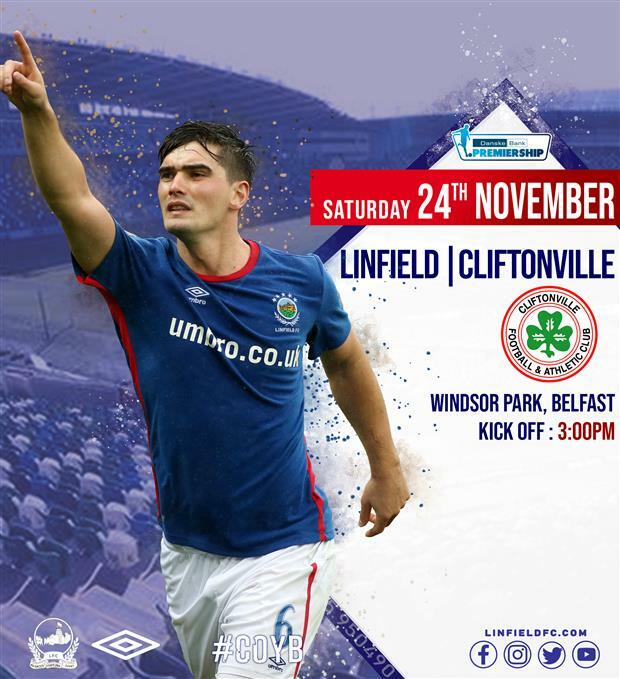 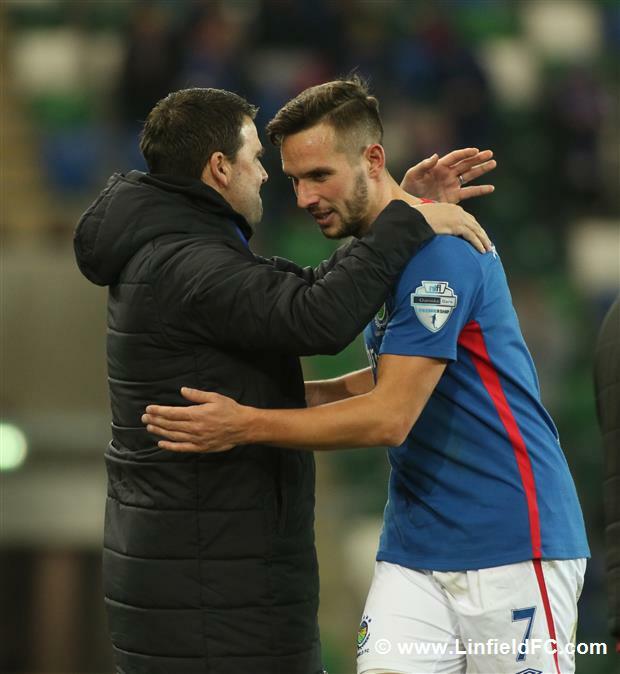 Linfield restored their two-goal cushion on 58 minutes when Kirk Millar produced yet another delightful cross from the right and Andy Waterworth made no mistake with a well-placed header into the net. 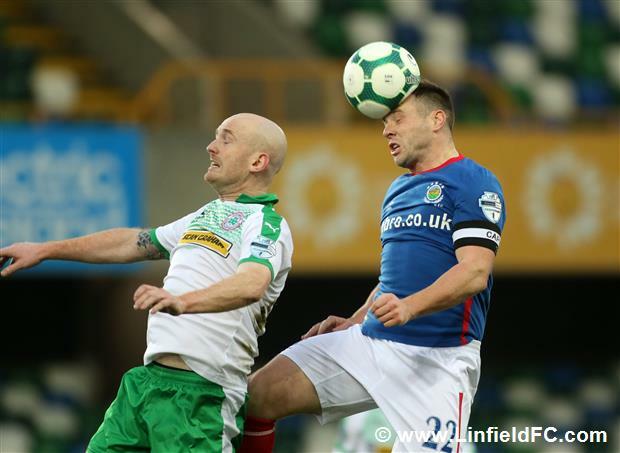 Cliftonville refused to give up and got themselves back in it once again just two minutes after Linfield’s third. 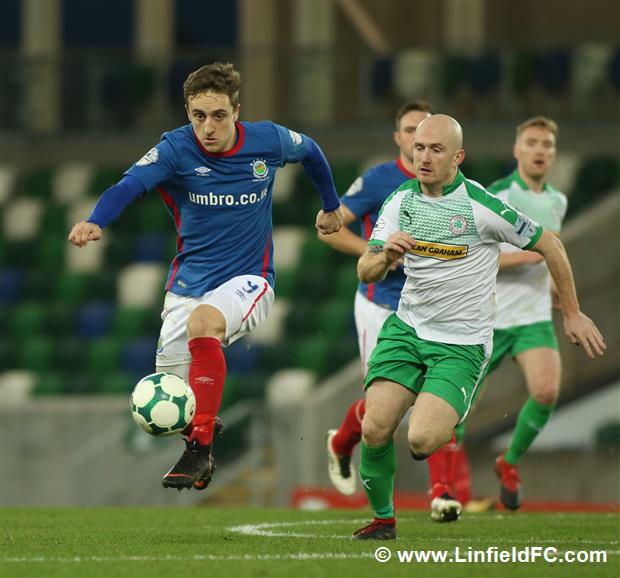 A corner came in from the left and substitute Garry Breen headed across goal for defensive partner Jamie Harney to nod into the corner of the goal. 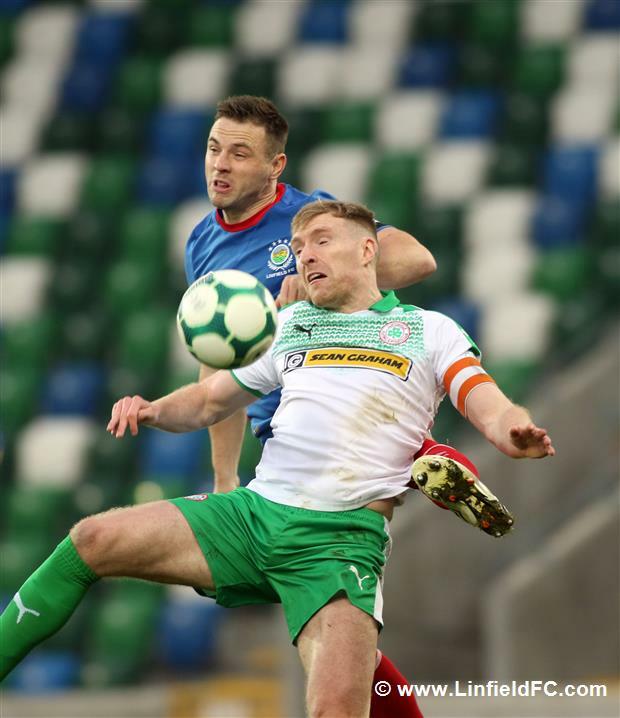 Joel Cooper threatened a fourth but even at full stretch he couldn’t quite get the telling touch on Stephen Fallon’s driven cross after Waterworth’s neat backheel to find Fallon. 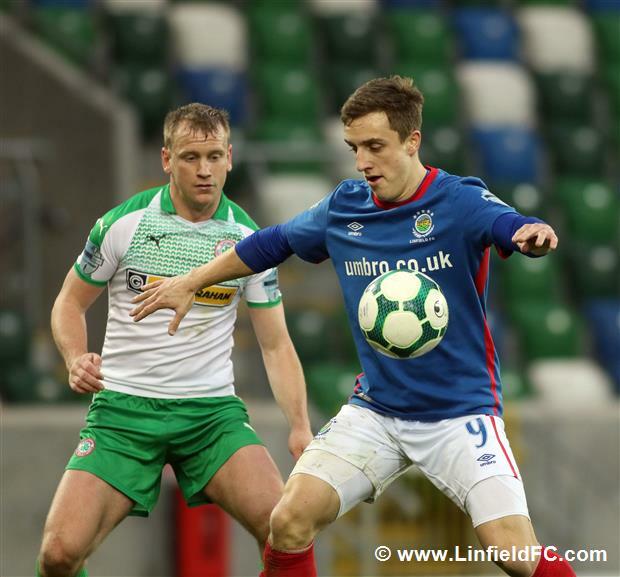 Waterworth himself was denied by Neeson from close range as The Blues tried to kill off the game. 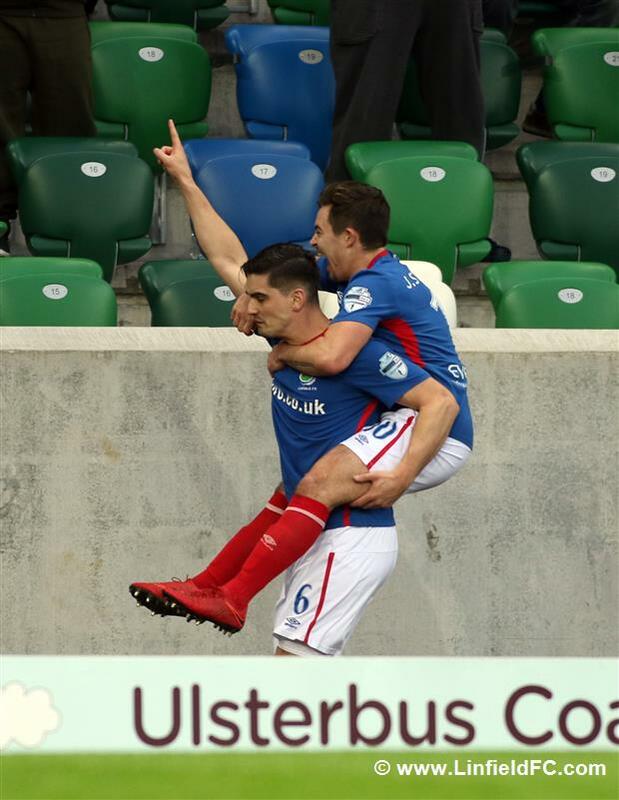 Thankfully, they managed just that on 82 minutes. 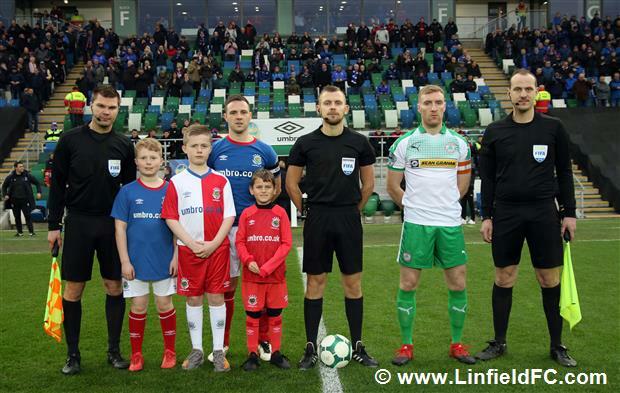 Instrumental captain Jamie Mulgrew picked out Niall Quinn with one of the passes of the season which took the Cliftonville defence out of the equation – simply exquisite and Quinn slid the ball low across the face of goal for Andy Waterworth to slot home for his hat-trick. 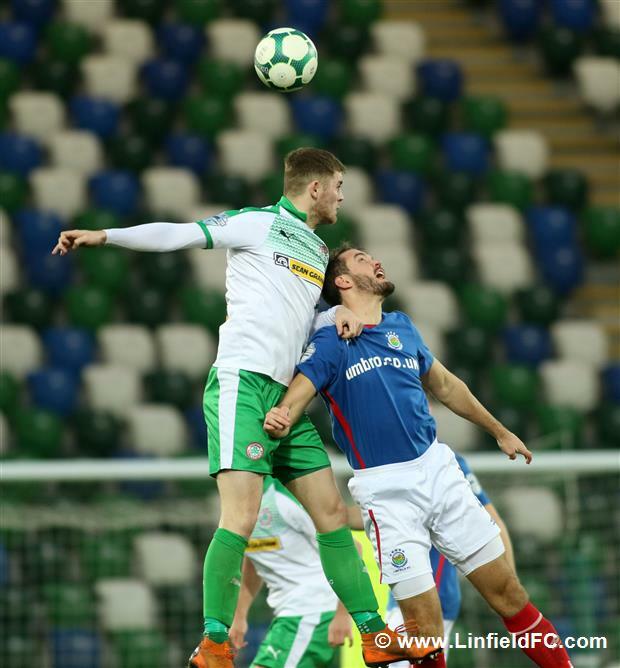 Cliftonville, to their credit, refused to accept their fait with a few close chances in the dying minutes. 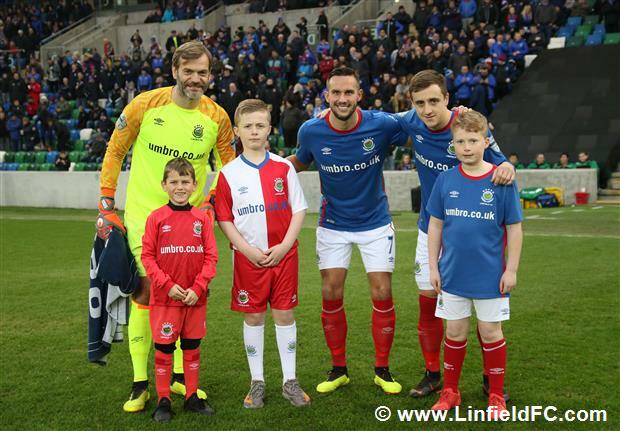 Roy Carroll beat away Ryan Catney’s thunderous effort to confirm an emphatic victory in a thrilling game of football. 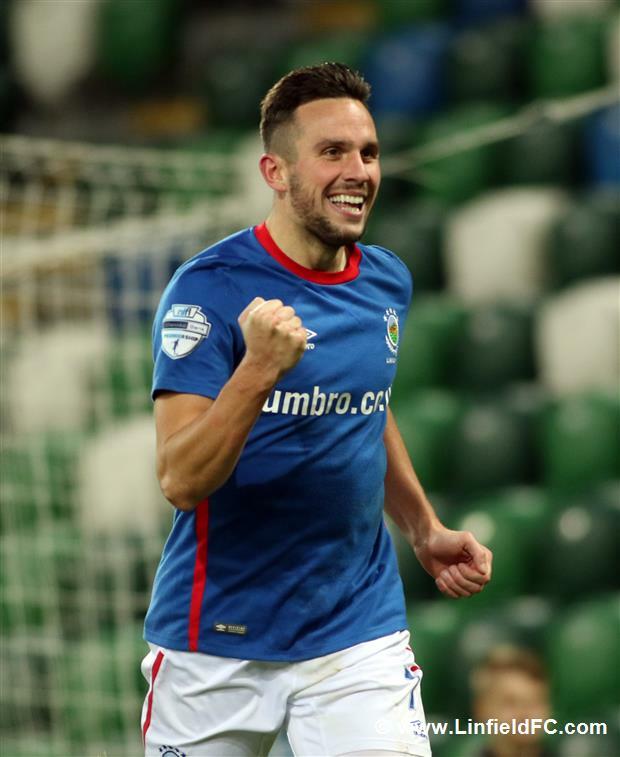 Andy Waterworth : Happy Days for a Striker!